NOTRE DAME, Ind. – Capitalizing on a three-week block of intense training, the Florida State throws group turned the throws circle at Saturday’s Alex Wilson Invitational into their own personal-best playground. With Gleneve Grange demolishing her own FSU school record and Austin Droogsma becoming just the second Nole to eclipse the 20-meter indoor benchmark, FSU swept the shot put titles. When the day with through all five competing Noles throwers had new personal-best marks in the final tune-up for the ACC Indoor Championships, which begin Thursday at Clemson. Grange got the day started for director of field events and throws coach Dorian Scott’s group, unleashing the furthest of three 17-meter throws on her opening attempt. The 17.24-meters (56-6.75) opener laid waste to her previous school record of 16.54 and sent her racing up the collegiate national rankings to No. 10; a virtual lock to advance to the NCAA Indoor Championships for the first time. The Jamaica native followed with legal marks of 17.19 and 17.23 for the finest series of her career, supplanting Louisville’s Emmonie Henderson as the No. 1 seed at the ACC Championships. Henderson, who has won the last five ACC titles between the indoor and outdoor seasons, has a season-best of 17.05. As an added bonus the Noles also earned a fourth-place finish from graduate transfer Ieva Zarankaite, who dropped her own lifetime-best (15.41m/50-6.75) and moved up to No. 5 in the ACC rankings. It also moved her to No. 8 on FSU’s all-time list. Redshirt freshman Shanice Love (11.90m) also came away with a career-best effort. Following the tone-setting women’s shot put performance, junior Brandon Tirado was intent on keeping the momentum going in the weight throw. Capping a performance including three throws over 19 meters, Tirado’s sixth attempt personal-best of 19.79 meters (64-11.25) sealed a runner-up finish at the No. 3 seed next week. 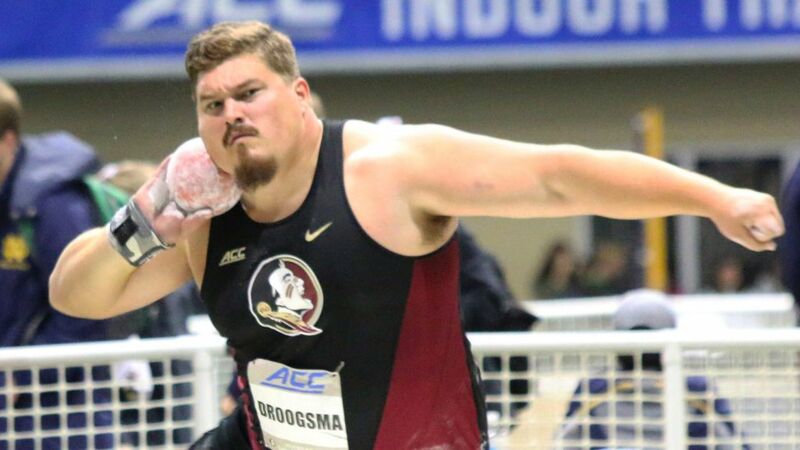 Over in the men’s shot put circle, Droogsma was gnashing his teeth in anticipation of something special. Despite an opening foul, he wouldn’t have to wait for long. With a second-attempt blast of 20.10 meters (65-11.5), the Gulf Breeze, Fla. native became just the second Seminole in program history to eclipse 20 meters. Only former NCAA champion Garrett Johnson’s 2006 20.48-meter mark (67-2.25) in longer in Noles lore. Proving that the monster was no fluke, Droogsma – currently residing at No. 4 among all NCAA Division I throwers this season – added three more throws further than his outdoor career best, closing out the completion with a 19.91 sixth attempt. It wasn’t a perfect day for the Noles competing at Notre Dame’s Loftus Center, but it was a productive one. Returning to the scene of her ACC Indoor triumph last season, Eleonora Omoregie won the high jump with a season-best leap of 1.74 meters (5.-8.5). Meanwhile the men’s distance medley relay team of Toby Hardwick, Calvin Golson, Bert Freire and Istvan Szogi raced their way into the fast heat the ACC Championships with a time of 9:48.45 against a loaded field. “The distance medley simply wanted to get an ACC fast section mark, so mission accomplished, but we were definitely a little flat coming off our big meet in Boston,” Braman said. Still, the quartet still managed the eight-best DMR time in Noles history, lowering the team’s previous season-best of 9:51.97. Michael Hall wasn’t as fortunate in his encore to last week’s 3:59.37 mile run at Boston University’s David Hemery Valentine Invitational. While hoping to improve and move into the top 16 nationally, Hall went down in a second-lap crash, which fortunately did not result in injury. On Friday at Texas Tech’s Matador Qualifier in Lubbock, a quartet of FSU competitors came away with three victories and a runner-up finish. Freshmen Jayla Kirkland and Ka’Tia Seymour went 1-2 in the women’s 60-meter dash, with Kirkland lowering her collegiate-best to 7.34 for the win. That moved Kirkland to No. 7 on FSU’s all-time list. Seymour was second in 7.36. The Noles swept the 60-meter hurdles races with sophomore Cortney Jones claiming the women’s title (8.32) and freshman Trey Cunningham (7.85) claiming the men’s title. With an eye toward title chases at Clemson, FSU’s weekend of last chance opportunities was a fitting preview, with the Noles authoring six events wins and a school record among six personal-bests.